-The new EW cover is awkward, no? 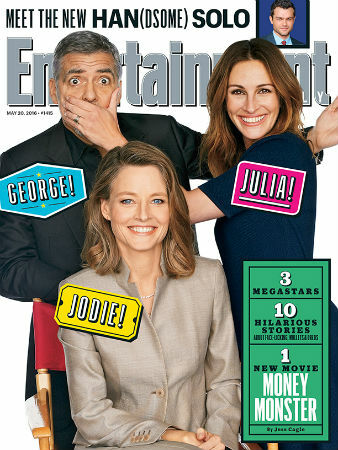 I don’t know if it’s because Julia Roberts looks like she’s trying to make it all about her, or because George Clooney‘s hand is reaching out of frame, or because Jodie Foster is having no part of it, but there’s a cringe factor there. The interview is cute though, especially the part where Julia remembers crushing on George when he was on Sisters. -Meanwhile, the best part of this Buzzfeed interview with Jodie is when she lets it slip that she only had eight days to film Julia‘s part. Like, what else was she doing?! -Also, Julia walked the Cannes red carpet barefoot. Remember last year when they were kicking women off the red carpet for not wearing high heels? But Julia gets to Julia it up. -Some Tumblr peeps just wrote the best movie script in the history of ever. -CBS is in talks to create a Good Wife spinoff starring Christine Baranski and Cush Jumbo for their streaming service. Um, what? -It’s official. Supergirl was renewed — but it’s moving from CBS to the CW. I’m surprised the were able to keep Calista Flockhart, since production is moving from LA to Vancouver. Also, when exactly is the network that renewed all of its current shows (and just ordered three new ones) going to schedule it on their already crowded lineup? Best case scenario: it forces them to cut all of their 23-episode shows into tighter 15-18 episode seasons, and repeats/hiatuses disappear. -Speaking of the CW, this interview with super producer Greg Berlanti is great. -In other network news, the CSI franchise is finally dead, and ABC just cancelled Nashville. Go hug your moms. –Robert Downey Jr liked Happy Endings so much, he hired Adam Pally to do his social media for him. God, I love rich people. –Nicolas Hoult’s dubsmash is some pretty great X-Men marketing. -Being pals with Anna Kendrick has its perks: she supplied her BFF’s “something borrowed” on her wedding day: thousands of dollars of borrowed diamonds. –Woody Allen‘s publicist says it’s “only natural” she’d ban THR from a Cannes lunch because they published Ronan Farrow‘s essay. Sure. -Meanwhile, Blake Lively ripped Cannes for that controversial Woody joke. She would. –Lupita Nyong’o is in talks to star in Marvel’s Black Panther (yasss!) as the love interest (boo!). She should be leading her own superhero movie. Black Canary? Vixen? I’m not picky. -Watch Chris Pine rob banks in the new Hell or High Water trailer. –Michael Fassbender goes back in time in the first trailer for Assassins Creed.